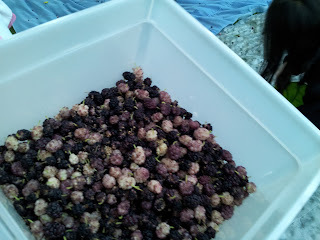 My earliest recollection of mulberry eating were at Peterson park in Chicago. It was there where I saw a row of the trees completely littering the ground. Black little things all over the ground. I asked my mother or father if they were edible, and once I got a green light, I never stopped eating them. I've come to know over the years that my grandmother would even make a tea out of the leaves that was supposed to help diabetes to some extent. 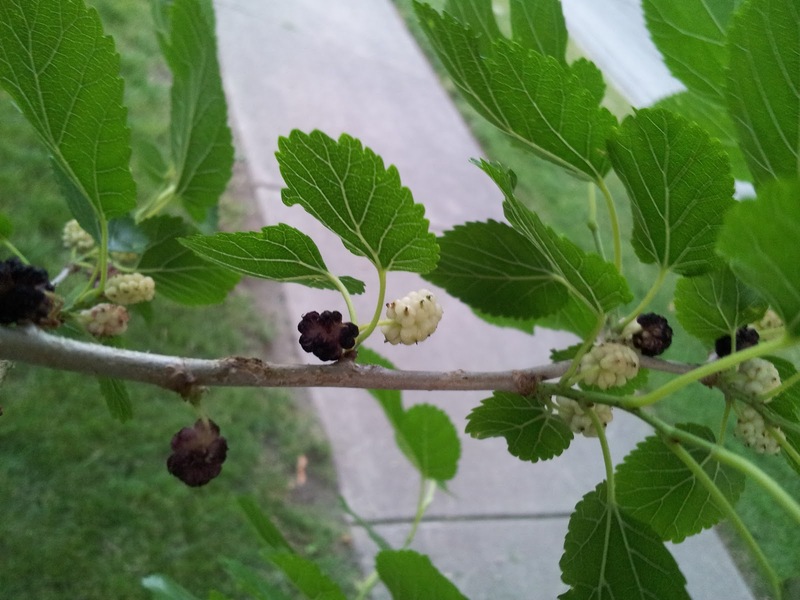 Koreans have an affinity for the mulberry as a herbal medicinal plant. I realized over the years where they were mapped around the city, so I could come back to them when it was season. My brother and I would return home with purple stained fingers, clothes,and mouths. Friends or classmates would think we were crazy when we ate out of any trees by the school, and question how sure I was that it's not poisonous. I took mental notes that the berries that turn white/light purple when ripe are way sweeter than the ones that turn black, and they wont stain your clothes! I pretty much made a pact with myself that whenever I had kids, I would teach them all about all this food that grows all over the place that is barely eaten. 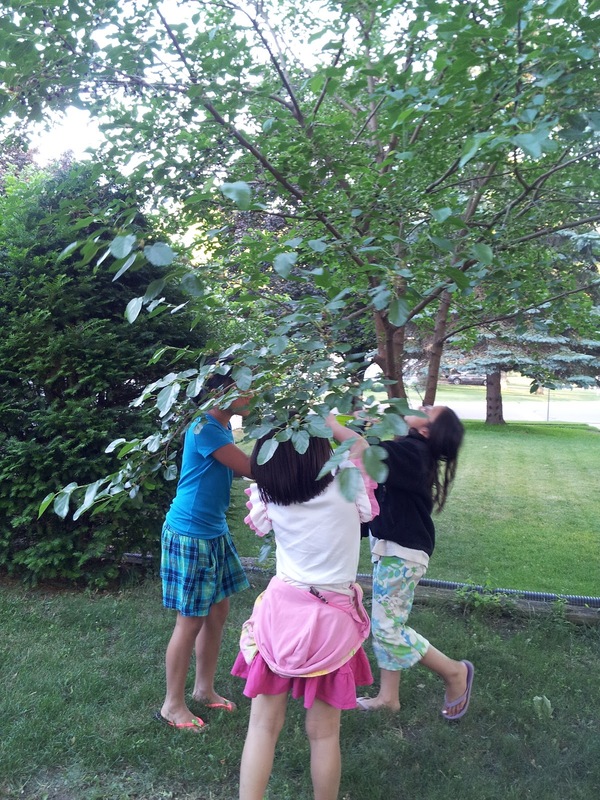 In this photo, not only are my children picking from the trees, but our neighbor's daughter as well. I've had the joy of inadvertently teaching the neighborhood children. Some from further down the block were surprised to see me harvest a potato out of the side garden one year. "Potatoes come from the ground?! ewwww!" ... well, they had to learn sometime. It was either going to be then or the back of the bus. "I'm not sure, so let's assume yes until we find out". That goes for mushrooms and any foraging, too. Always better to err on the side of caution. Here we have administered the "lay something on the ground, and shake the branches furiously" technique, which has the kids scrambling for berries as though a pinata had burst. Kel asked me to try making a Jelly/Preserve out of this. I told her I'd give it a try, and currently the mulberries are sitting in my freezer waiting for a day that isn't 100+ degrees. Our haul. Not much, but the small tree at my friend's house gave the kids enough mulberries to snack on, to take home, and childhood memories for a lifetime.